Home BOLLYWOOD Rani Mukerji’s Hichki Trailer Attached To Tiger Zinda Hai! Rani Mukerji’s Hichki Trailer Attached To Tiger Zinda Hai! 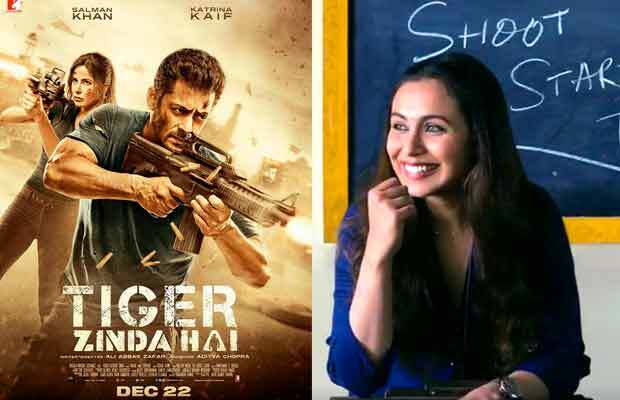 Rani Mukerji's Hichki Trailer Attached To Tiger Zinda Hai! Rani Mukerji‘s next, Hichki, that celebrates the human spirit of endurance and self-belief to rise against all odds, is an anticipated release of 2018. A content film that will touch hearts, is set to be released on Feb 23 and sources confirms that the Hichki trailer will be attached to Salman Khan‘s mega action entertainer Tiger Zinda Hai. ”Hichki is a film for all age-groups and as a story, is relatable pan India. It is a happy and uplifting story of self-belief and celebrates human spirit and hope. The makers wanted Hindi movie-goers across India to sample the trailer and make a note of a film that has its heart in the right place. What could be better than attaching the Hichki trailer to the massive event film Tiger Zinda Hai which will be seen by audiences across the world,” says a source close to the development. ”The makers have charted out an extensive strategy once the trailer hits the theatres. Rani will be fronting the campaign and she will go all-out promoting the film. She loves what the film is communicating and is thrilled about how the film has shaped up,” the source adds. YRF’s Hichki is a positive story about turning disadvantages to opportunities. The film is produced by Maneesh Sharma and has been directed by Siddharth P. Malhotra. With a powerful Rani performance as its main attraction, audiences are set for an entertaining, feel-good, content film coming their way. Previous articleWatch: Saif Ali Khan Shares HILARIOUS Story Of Sister Soha Ali Khan’s Embarrassing Date! Next articleWatch: Anushka Sharma’s Family Returns To Mumbai For Grand Wedding Reception!